Built in the 20th century by Friedrich Alfred Krupp who dreamed of building an ambitious mansion, the Garden of Augustus have incredible vantage points and boast of beautiful flowers that add to the awe inspiring beauty of the location. 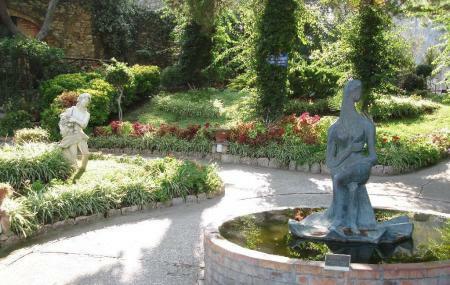 The gardens were donated to Capri after Krupp died in 1902. Via Krupp is another brilliant feature of these gardens which is actually a zig zag path that leads to the sea. The road with its winding hairpins turns is considered to be a work of art and an engineering feat. Dahlias and Germaniums circle a glorious fountain that take a place of pride in the garden. Visitors can experience the great views where to the left are the imposing Faraglioni while to the right is Marina Piccola and the sheer cliffs that lead up to the summit of Mount Solaro, the highest point on the island. The gardens are open only from Easter to November, from 9:00 am to one hour before sunset. Be sure to bring your binoculars and camera as you will want to get some photos of this incredibly beautiful area of Capri. You can get similarly spectacular views for free by climbing up the steps opposite the entrance to the gardens to the small terrace guarded by lion statues and a monument to Lenin, a famous habitué of the island. Entry to the Augustus Gardens costs €1 from the beginning of April to the beginning of November. The best way to reach the gardens is on foot or by cab. How popular is Gardens Of Augustus? People normally club together Anacapri and Marina Grande while planning their visit to Gardens Of Augustus. Amazing views!!!! Beautiful place to just take in the vistas and if timed right you can sit and admire the scenery in peace before the crowds arrive. Most places were still shut as the place closes down for the season but I think it's best to go in April as it's quite and you get to enjoy the place and take it all in. nice outdoor space to get away fro. the shopping frenzy and crowds. fantastic views of the south side of the island. Hard work walking there from Marina Grande and I recommend the Funicolare/tram but totally utterly worth it. The views are absolutely magnificent - jaw dropping - and the gardens themselves are very pretty. 1.Euro entry is very very reasonable. A must-see. The best view in Capri indeed without a drone or a paraglide. :P Lovely flowers make it doubly beautiful. Must see in Capri.